Mom was out with her 3 year old son when they noticed a faint chirping coming from the ground in front of them. As they got closer to investigate, they first thought they found a baby bird who had flown out of its nest and was unable to fly back. But on closer inspection, mom noticed it was a hummingbird, trapped in a piece of gum, trying its hardest to fly away. She carefully picked up the hummingbird to get a better look at the extent of where the gum was spread to. She noticed most of it was attached to its wing and body, leaving it immobilised when it was trying to fly away. After a careful on the spot procedure to remove the gum, the hummingbird was back up on its feet and ready to fly away! This is why you don't throw gum outside. (With a three-year-old's commentary.) 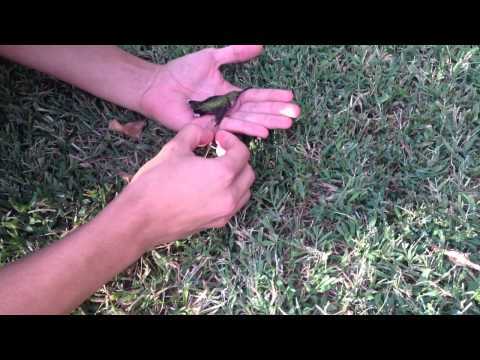 Hummingbird rescued!